In his last appearance in a Red Sox uniform, Pedro Martinez pitched seven scoreless innings to help the Red Sox take a 3-0 lead in the World Series. 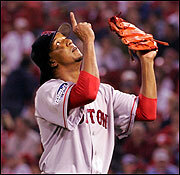 Eventual MVP Manny Ramirez homered and drove in two. Dan Shaughnessy: It looks as if the planets really are aligned for the Red Sox this time. A lunar eclipse is due to start less than an hour before the Sox and St. Louis Cardinals play the fourth game of the World Series tonight. If skies are clear, the moon over Busch Stadium will be blood red in the late innings. There has never been a full lunar eclipse in the middle of a World Series game. Red October, indeed. Eric Wilbur: One win does the trick. Today, tomorrow, Saturday, or Sunday. One win. The Red Sox are up 3-0 in the World Series over the Cardinals. No matter how many times you say it, it doesn’t seem real. It doesn’t seem possible.